Previous ArticleLandlord Inventory: DIY or use a professional service? The Reeds Rains team in Driffield have embraced the opportunity to take part in the annual Driffield in Bloom competition and celebrate not only the local town but a great national institution too. 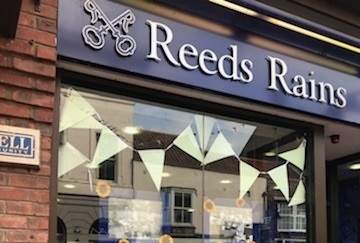 Linda Taylor, branch manager for Reeds Rains in Driffield explained; “ We were delighted to enter the competition which involves local businesses dressing their windows with flowers and generally helping the town to look as attractive as possible. This years’ theme is Centenary Celebrations and, as we are a market town and an all lady team, we thought what better way to celebrate than choosing the Women's Institute (WI) as our theme. I contacted the Head Office of the WI in London who have kindly sent me black and white photographs from their archive so we have blown them up and used our window displays to show the ladies ‘back in the day’ – and, of course, the Sunflower plays centre stage along with Jam and Jerusalem , we've even got a Victoria sponge on display. Linda and her team can be found at 6 Market Place Driffield.